The proms season is upon us once more but sadly, for Busman John at least, it doesn’t involve any Pomp or Circumstance. No, a busman’s lot is a noisy but unmusical one if he is to be sent on a school prom duty. Once called the School Leavers’ Party (or, if you went to a posh school, End of Year Ball), the general term used nowadays is Prom. An American import, I suspect. Today I had two school prom duties in Torquay, both with the English Riviera Sightseeing Tours Leyland PD2 (FFY403). This morning’s tour was a very busy one, with 40 sightseers on board. Once we’d returned them to the harbourside at Torquay I bade farewell to my Tour Guide, who had the afternoon off. Taking his place on the platform was my son Peter, whose last duty with me was at Salisbury for the Wilts & Dorset Centenary. We like to keep it in the family! 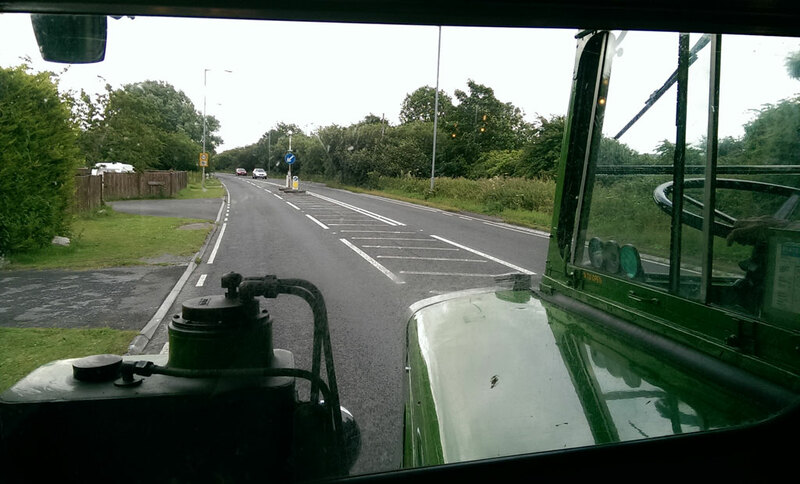 We took the PD2 off-route past Torquay’s two Grammar Schools and into Sherwell Valley Primary School. I had to smile as we drove slowly past several classrooms, repeatedly capturing the awestruck attention of the excited pupils within. In the school playground, which this afternoon was turned into an impromptu bus station, the PD2 was decorated with balloons, streamers and class photos. Soon we had been joined by two stretched limousines and three pink minibuses. Yes, dear reader, pink. 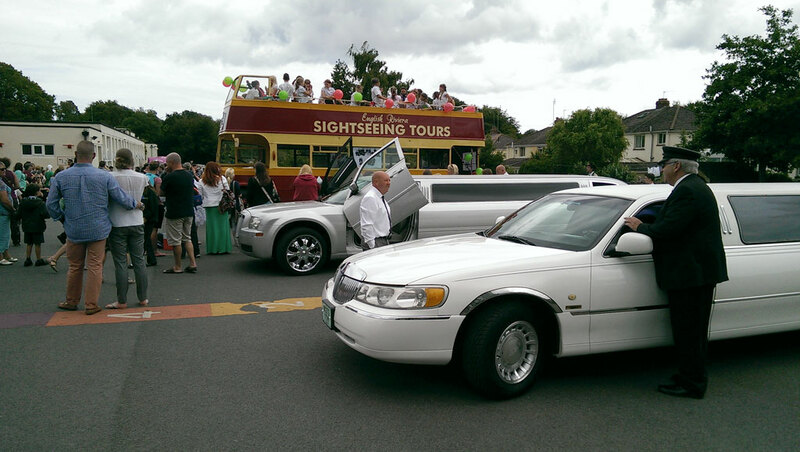 This incongrous collection of celebratory conveyances was booked, not by the school, but by the parents of the Year 6 pupils who were leaving the school to start their secondary education. Using the on-board PA apparatus, I welcomed the ‘little darlings’ onto the bus and gave our customary warning about staying seated and the potential hazards of passing beneath low branches. Finally, a question: “Are we all going to have fun?” to which the answer was a loud cheer. With that out of the way I started up the bus and confronted the first hazard, which had the potential to be a literal showstopper. The school caretaker had opened a gate at the end of the playground to enable the vehicles easier access back to the main road. I had earlier checked this out and was concerned to find a short, sharp gradient leading up to the road. Aware of the possibility of the rear of the platform going aground as the front of the bus tilted upwards sharply, I passed through the gate very slowly listening for a grating sound. There wasn’t one, thankfully. If I had been driving a Bristol FLF we would definitely been in trouble! 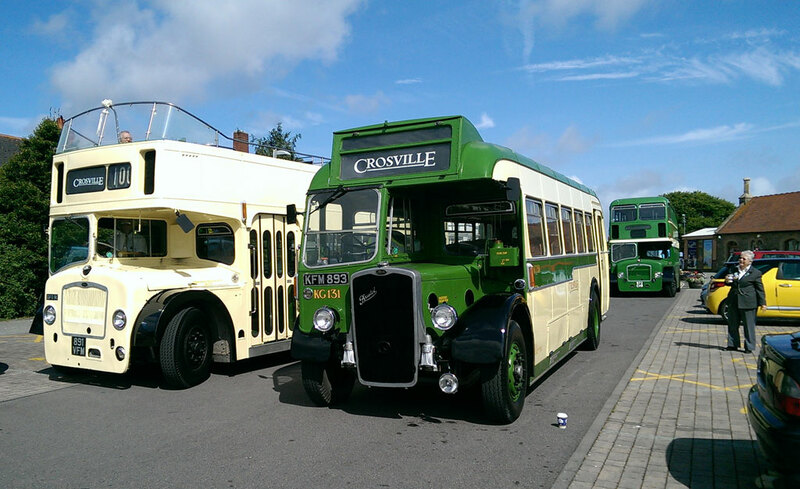 My latest duty for Crosville Motor Services involved another trip to Minehead in support of the West Somerset Railway. It was an action-packed day which included a surprise appearance by a bus I have been itching to sample for ages. Rising at silly-o’clock-in-the-morning for an early drive up from Torbay, I booked on at 08:00 at the Crosville depot in Weston-super-Mare. The previous weekend I had done the same duty so the early start was slightly easier to cope with. On the first occasion I led a convoy of three heritage vehicles, a closed top Bristol Lodekka, an open top Lodekka and an open top Bristol VRT. The reason being that, by common concensus, I knew the route to Minehead better having done it twice before already. One of these, ex-Bristol Omnibus 1959 LD6B LC8518 (972EHW), was left in the First bus depot in Minehead as it was required on both weekends. The duty, as previously, involved providing free bus rides for those attending the special event at the West Somerset Railway (WSR) which, on these two weekends, was a ‘Days Out with Thomas’ event. Owing to the fact that my rostered bus was already in Minehead, I travelled as a passenger on ex-Crosville KG131, a 1950 Bristol L5G (KFM893), with my friend Dave Moore at the wheel. 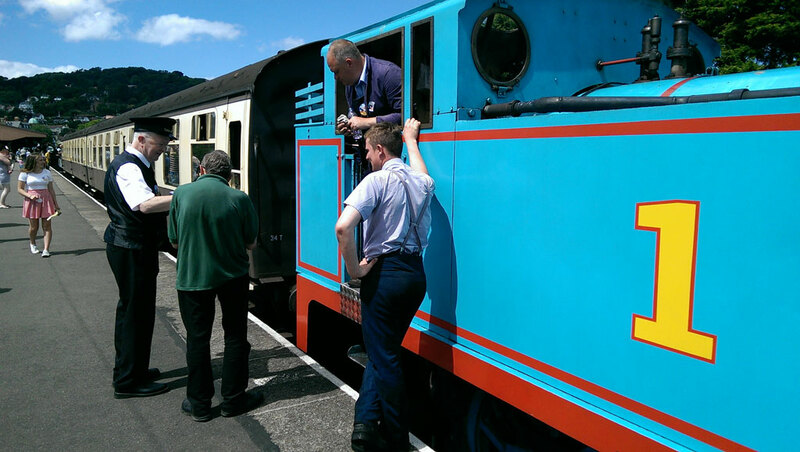 It was unusual for me to be riding in the passenger saloon and I was surprised at how quiet it was, compared to the racket that I’m used to hearing in the cab! Admittedly it’s a very agreeable racket. The action kicked off at about 10:20 but, until the first train arrived from Bishops Lydeard with more passengers, takers for the free bus rides were few. Conductor Kemble and I were in charge of the closed top Lodekka and we clocked up a grand total of 3 trips in the morning. As predicted, the open top Lodekka, 1961 ex-Crosville DFG81 (FSF6G 891VFM) was the most popular with people eventually queueing up to board before it had even arrived back from its previous trip. Our 15-minute route was the same as before – a short jaunt up the main street and then along the seafront to Butlins and back – just long enough to give people a few good views and of course a decent ride on a vintage bus! Now that I’m working on the sightseeing tours 5 days a week and also some Saturdays for Crosville, life has become rather hectic of late. Hence the lack of new posts. So, to bring you up to date, here are some recent happenings in Busman John’s world. A significant sighting this morning was ‘Illustrious’, a Bristol VRT acquired by Rail River Link (the bus operation run by the Dartmouth Steam Railway & Riverboat Company) in 2013 from East Yorkshire Motor Services. Originally 938 (‘Warspite’) with Western National in 1977, it finally entered service last week on the 100 service from Torquay to Totnes via Paignton. It has spent much of the last 2 years in storage awaiting and undergoing an engine transplant. It arrived from EYMS under tow, having suffered an engine seizure before withdrawal. Now, wearing RRL branding over the existing EYMS livery, 938 is active once more in Torbay where it once operated (wearing Devon General fleetnames) when new. When I was working for RRL in 2013 I had a slim chance of driving 938 in service but, as it turned out, its return to active service has been rather protracted. 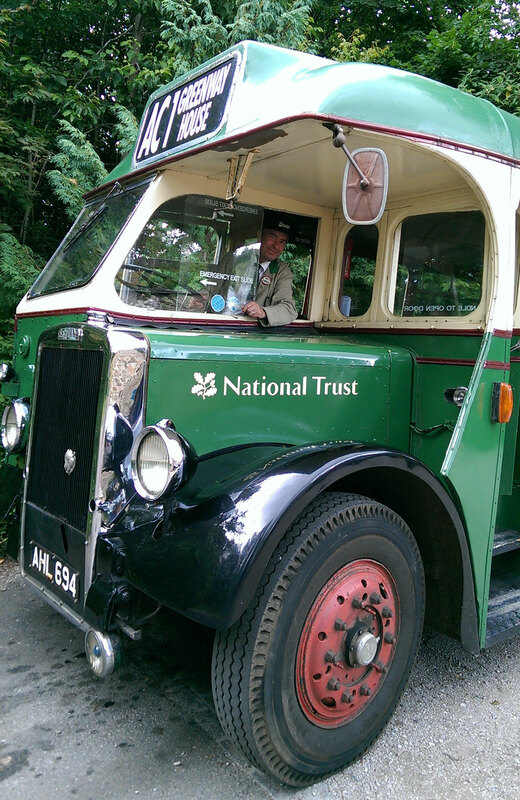 If you hadn’t already heard, the Leyland Tiger PS1 which was operated by Greenway Ferry to the National Trust’s Greenway House (Agatha Christie’s former summer home), has not run at all this year and rumour has it that the ferry and bus operations are up for sale. 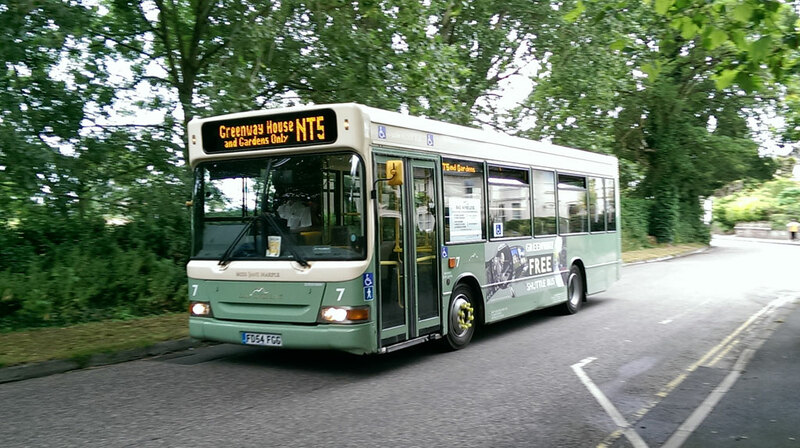 To fill the void, Rail River Link has acquired a 2004 Dennis Dart and is now operating it to Greenway House. NT1 runs to Greenway from the railway’s Churston Station and the early morning NT5 runs from Torquay. This is where I managed a quick passing shot of it a couple of days ago. FD54FGG is especially branded for the Greenway service and carries the name ‘Miss Jane Marple’.